Celebrating the release of the new game Skylanders Trap Team, IDW have brought Spyro the Dragon and his friends to comic books for the first time ever. Skylanders #1 will premier this October. It’s written by Ron Marz and David A. Rodriguez, with full-color art by Mike Bowden, David Baldeon, and others. 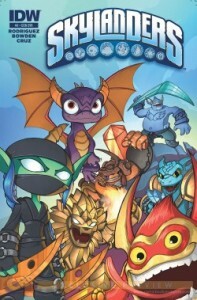 At the same time IDW will release Skylanders: The Kaos Trap, which will collect the first three issues of the comic together with the special issue #0 that was only available at San Diego Comic Con — all in a single hardcover collection. Take a look at the IDW web site for more. Posted in: Comic Book News, Games.